The American Veterinary Dental Society recommends a full dental cleaning every six months for your pet, just the same as your dentist recommends for you. Still, imagine what that cleaning procedure would be like for you if you did not brush your teeth at all between dental visits. Dental home care is the single most important aspect of regular dental care. With proper home care, your pet may not need that six month dentistry, thus saving you the expense and your pet the extra anesthetic. Just as with your own teeth, nothing beats brushing. The fibers of the tooth brush are able to reach between teeth and under gums to pick out tiny deposits of food. A toothbrush acts as a tiny scrub brush for the closest possible cleaning. Notice the shape of the canine and feline brushes and how they conform to a pet's mouth. You can use a human toothbrush but you will probably find it difficult to manipulate in the pet's mouth. DO NOT USE A HUMAN TOOTHPASTE ON YOUR PET. Toothpaste for people contains sudsing agents which are not expected to be swallowed. These will upset your pet's stomach as your pet is not able to rinse out his or her mouth. Pet toothpaste comes in a variety of flavors: mint (which people tend to prefer as a scent but animals do not prefer as a flavor), chicken and salmon. Some cats will not allow anyone to reach into their mouths for any reason and will not tolerate brushing, rinsing or any other home care. For these animals dental treats represent an excellent method of dental home care. Feline tartar control dental treats help remove plaque. We recommend a treat or two daily for routine home care. In the dog, research has shown that daily rawhide chewing can be as beneficial as brushing. We carry compressed rawhide-like chews that contain an enzyme which helps prevent the build-up of dental tartar and remove plaque. Realizing the difficulties involved in dental home care, some therapuetic diets have been created to break calculus off of teeth. If you would like the benefits of performing dental home care without actually having to schedule time, this may be a viable option for you. 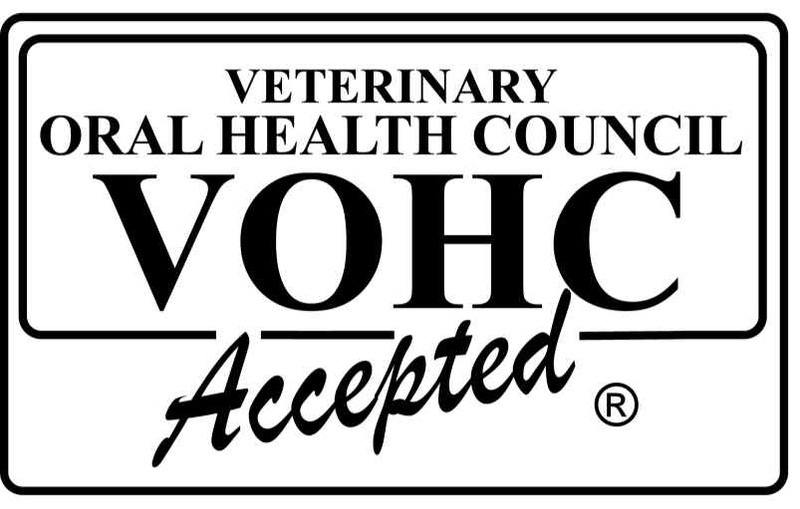 Please visit the VOHC website for more information on which products are accepted for dental health for your cat or dog.